Ready for some Monster Madness? 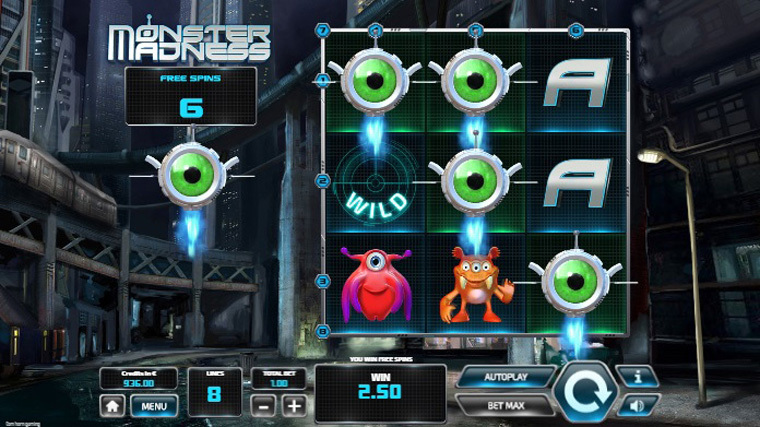 The online casino software providers from Tom Horn Gaming have created this 3×3 grid filled with monsters that will get you some extra-terrestrial big wins. With 8 paylines, a 95.03% and a fruitful bonus round, this fun and adorable slot might be your next favourite. Free Spins – at least three scatters will trigger the free spins bonus round. Depending on how many scatters trigger the bonus feature you will get more and more free spins. For three scatters you get 5 free spins, but you can get up to 11 spins. During free spins there are no more wilds and scatters, but you will find a Scatter Wild that will award 2x multipliers. If you get more multipliers in a single winning combination the multipliers will be multiplied together. Gamble feature – there is also a simple and classic gamble feature in which you need to guess the colour of the next card drawn. If you guess right, you double your win.